Our special Veterans Day show features two Veterans, both with upcoming debuts. 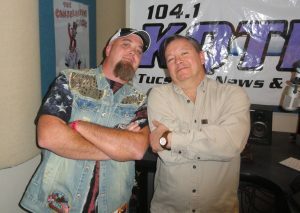 Rowdy Johnson is a Navy Veteran and a talented country music artist. He recently encountered a homeless Veteran on the streets of Tucson and was compelled to put that man’s story to music in the song “Unwanted Man”. Rowdy has also organized a special concert at the Fox Tucson Theatre Nov. 15 to raise funds for the Tucson Community Foodbank and homeless vets. This special event will also feature “Blind Joe” Bommersbach, a finalist on NBC’s “The Voice” and daredevil extraordinaire Dr. Danger from America’s Got Talent. The Rowdy Johnson Band will debut the “Unwanted Man” music video at the Fox. Rowdy’s life reads like the inspiration for every country music song ever written. But this friendly young man transfers that pain and heartache into his music and it shines through. After a hardship discharge from the Navy, he began writing and recording music just for his family. Pretty soon he was approached about performing at a fundraising event for Wounded Warriors. He eagerly agreed and then realized – he didn’t have a band! A few hurried online classified posts later, the Rowdy Johnson band was formed. Michael grew up the prototypical southern California youth but always knew he wanted to serve in the military. He became a member of the 1st Ranger Battalion and had 10 combat deployments serving in every duty position from rifleman to weapons squad leader. He was approached by Navy SEAL friend Ray Mendoza about helping with a project that would become the History Channel series “Live to Tell”. The Warfighters continues in the same vein, portraying the high stakes environment that members of our military must operate in and the challenges they face doing so.